County in the 1940s and 1950s, it seemed we could always expect a snowfall between the dates of November 8 (sister Teresa’s birthday) and November 13 (brother Bob’s birthday). Dad listened to radio station WMT out of Cedar Rapids for farm reports and weather forecasts. Chuck Worcester came on at noon with the farm report and livestock markets. I think Dad learned much about farming and livestock, poultry, crops, and farm machinery from listening to the radio. WMT, 600 on the AM dial, broadcast obituaries. There were tons of Scheckels in the Bellevue, Springbrook, Preston, and Maquoketa area. Once in a while he would hear the passing of someone he knew. Same with my mother. She came from the Lewig family in the area of Luana, Monona, Alpha, and New Hampton area of Iowa. Both Dad and Mom were born and raised in the northeast corner of Iowa. Weather forecasts in those days were not very accurate. I recall one forecast in January1953 that said we were to have partly cloudy weather for the next few days. The next day we were shoveling 6 inches of “partly cloudy”. 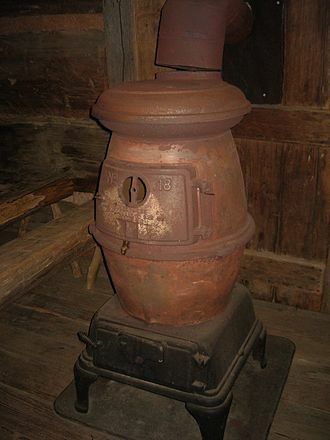 During my first three years at the one-room Oak Grove school, from about 1948 to 1952, we burned wood in the pot-bellied stove. A wood shed stood a few yards from the school. It served as a back stop for our softball field. I recall seeing the woodshed full of slab pieces that had been hauled from Vedvik’s sawmill on the north edge of Seneca. Every kid had duties at the end of the school day. It was the task of the older boys to haul in sufficient wood for the next day’s fire.